My experiment with updating each area in my blog’s tagline ( writing ~ faith ~ life ) took a twist, because early last month I decided a weekly update wasn’t the way I wanted to go. I thought, instead, maybe a couple of times a month – but then I ended up not even doing a second one last month. So… the experiment continues, but with no certain schedule or frequency. At least not right now. As happens with experiments, though, it’s all subject to change. And now on to the latest updates with writing, and faith, and life. I’m close to being finished with the current draft of the novel, and that feels good. Finishing this draft won’t mean being finished with the novel, but this a big step. My self-imposed deadline is the end of the month. Really, though, I’m hoping it will take less time. The anthology I was putting together is on hold for now. I’m waiting for clear guidance about going forward with it. Or not. And the plan I discussed in my last update – based on my realization that I need to work on fiction in the mornings – is going well. The writing is getting done. Not always as fast as what I consider ideal..
Last month, I wrote out the book of Philippians, one of my all-time favorite books of the Bible. Its reminders to focus on joy and thanksgiving – always helpful for me to remember – held some special importance the past weeks. With November and writing Philippians both over, I wanted to continue writing out entire books of Scripture because the practice has been such a blessing to me. John is the book I’ve been guided to next and I started writing it at the beginning of the month. This isn’t a December challenge for myself, though. I don’t want to rush through the Gospel of John (which is another very meaningful book for me personally) and so I probably won’t be finished by the end of the month. I’ve also started writing out the book of Psalms, using a different journal than I’ve been using to write the other books, and writing one Psalm every few days. This is an ongoing project and I have no idea when I’ll be finished. The important thing about all of this Scripture writing isn’t how quickly I can get it done and over with. It’s about spending time with the Lord and in the Word. One thing I’m not fond of this time of year is the early darkness. And all the cloudy (or flat-out rainy) days we’ve been having. My body, my mind, my emotions… all of ME seems to do best when there’s sunshine. I also do best when it’s not too cold and not too hot. Since I can’t control the weather, I try to find ways to make difficult weather easier for me to deal with. When we had a cold snap that made before-mid-November feel like the middle of winter, and I found myself struggling with the cold temperatures and the dreary skies, and I was wondering how in the world I was going to cope with the weather over the coming months if it was already having such a negative impact… I knew I needed to get very intentional about putting some strategies into place. I set about rearranging a few things in the eating space of our kitchen (where I keep my table-top easel to paint on canvas) to uptick the cozy comfort of the area even more than it was. I added more strands of fairy lights around the house. We have them all over the place, and use them all year long, but I realized more strands would be even better – and they’re being turned on even more than usual. I made the decision to spend more time in certain rooms on cloudy days, to take advantage of the natural light those rooms get. I created even more little spaces of cozy-comfort with throws and pillows and light… small nooks in corners or near chairs that feel inviting and warm. It truly has been a very intentional process. And as I get more ideas of things that might help, I’ll put those into place too. With writing, with my faith, with my life in general… I’m being reminded, again and even more, of how I need to be conscious and deliberate and intentional when it comes to doing things that can make a positive difference. And it matters because it really does make a difference, even if it’s sometimes a small difference. But you know what? Sometimes even a small difference is enough to make the difference. Don’t be afraid, for I am with you. Don’t be discouraged, for I am your God. I will strengthen you and help you. 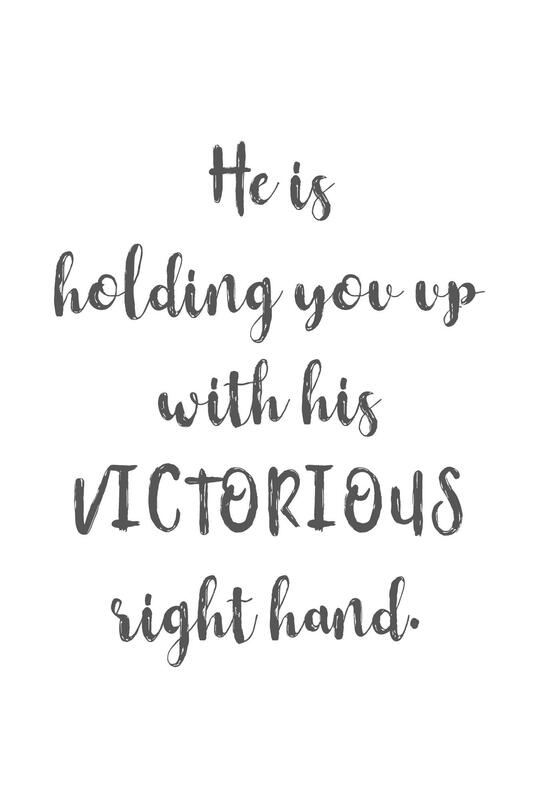 I will hold you up with my victorious right hand. This is one of many Bible verses where I find comfort, and strength, and the assurance that the Lord is always (always, always) with me. 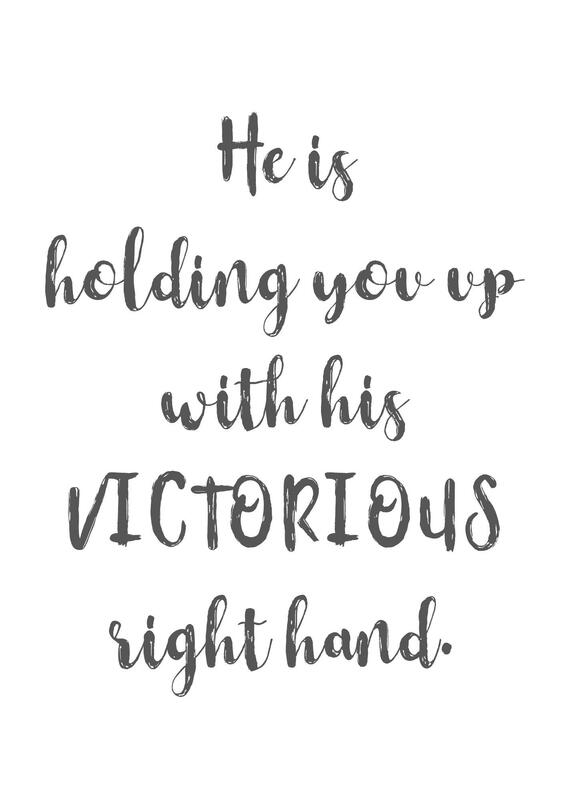 I’ve made a printable influenced by the words of Isaiah 41:10, and as with my other printables (which you can find here) it’s available for you to download, at no charge and nothing to sign up for. The files include the printable as a pdf, as well as jpg files for sizes 4×6, 5×7, and 8×10. 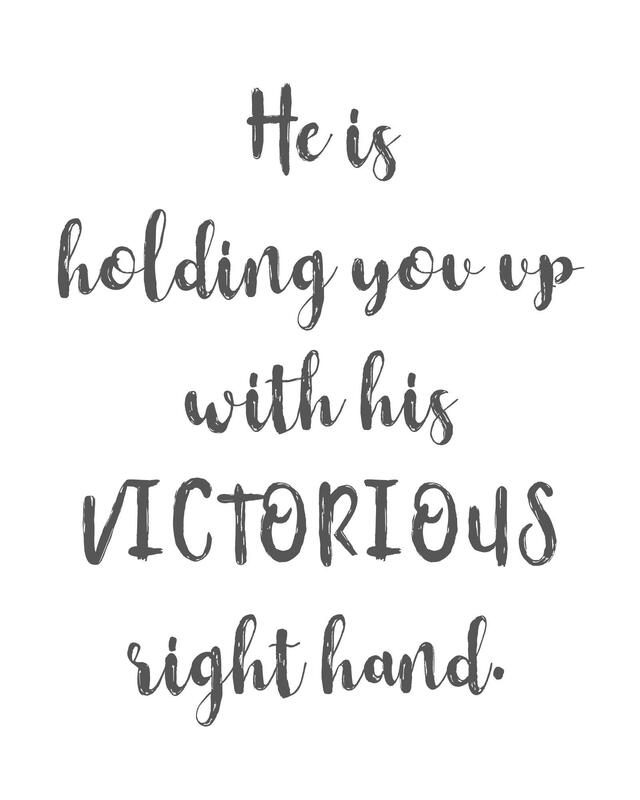 These are high quality, 300dpi, suitable for printing to frame, put on a bulletin board or refrigerator, or have somewhere as an inspirational piece or reminder. Get the pdf file here. The 4×6 jpg file is here. The 5×7 jpg file is here. The 8×10 jpg file is here. Again, the other free printables can be found here. I add new ones every so often, so check back or follow my blog to see the latest posts. As I mentioned in my last update, I realized a couple of weeks ago that – at least in this moment of time – if I don’t write some fiction in the morning, the fiction doesn’t get written that day. That realization, and admitting it to myself, led to making fiction writing part of my morning routine. This is easier said than done, especially as I’ve been in the process of changing my night-time and morning routines to something that works for me… and something that’s different than anything my night and morning routines have been in a very-very-long time. All of that is still very much “in process” and (for me) it can feel overwhelming to try to change lots of things at once… but I knew implementing a routine of morning-fiction-writing needed to be a priority. So I made a plan and put it into place and it’s been working for me. My overall morning routine is still something I’m trying to figure out, but I’m writing at least some fiction in the mornings – and that’s kept the writing momentum going. With October over and my writing of Ephesians completed, this new month called for a new challenge. My writing of Ruth in September and Ephesians in October came about from a group I’m in – and this month, the group challenge consists of daily verses related to giving thanks. I’m participating in the group challenge, but I’ve been so blessed by writing out complete books of Scripture, I decided to write the book of Philippians this month. Philippians is very important to me personally, in large part because of how it helps with my anxiety. So I’m writing verses and passages about gratitude and thanksgiving, and I’m also copying out the book of Philippians… spending time in the word of God. Last week, my husband and I celebrated 30 years of marriage. And the overflow of that joy spread to everything else.